How do I check the balance on a gift card or an e-gift card? If your gift card or e-gift card contains a PIN (example below), you may check your balance online. If you do not have a PIN, you can bring your gift card to any Marcus Theatres location and an associate will be happy to check your balance for you. You can also call our sales team at (800) 274-0099 x 1. Where can I purchase a Marcus Theatres Gift Card? Gift cards can be purchased online or at any Marcus Theatres location. I saw that Marcus Theatres is releasing a new mobile app. How will my mobile app gift(s) be affected? Marcus Theatres is excited to release new mobile app this fall. For your protection, gift card data will not save and transfer to the new app. If you do any of the above, you’re all set! 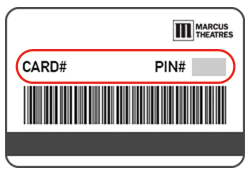 If you don’t plan to visit the theatre soon or do not have a physical card in your possession, you can also convert the gift card(s) to a physical card at any Marcus Theatres location or click HERE to convert online. Do you have e-gift cards? Yes. We have e-gift cards that are available for purchase and immediate delivery from our Online Gift Store. Can I purchase gift cards and e-gift cards in any denomination I choose? Gift cards are sold online or at theatre locations in denominations of $5 up to $500. Do gift cards or e-gift cards ever expire? No. Our gift cards never expire and do not carry any dormancy fees. Can gift cards and e-gift cards be redeemed online? Yes, gift cards and e-gift cards issued with a PIN can be redeemed at MarcusTheatres.com or through our Marcus Theatres app. If your gift card does not have a PIN, you can redeem your gift card at any Marcus Theatres location. Do gift cards and e-gift cards have any restrictions? No. They are redeemable at any Marcus Theatres location. Can your gift cards be personalized? Yes. We offer a variety of custom gift cards for every occasion for a small fee. You can view these options on our personalization page. Can gift cards and e-gift cards be reloaded? Yes. Marcus Theatres gift cards can easily be reloaded online for continuous entertainment! Plus there’s a 5% discount for reloads of $100 or more. Reloads take just one business day and can be completed through our Online Gift Store. Marcus Theatres Discount Movie Tickets are printed admission tickets that can be redeemed for the movie of your choice, all while saving up to 50% on general admission pricing. Discount Movie Tickets make the perfect gift or employee incentive. Visit our Online Gift Store or call our sales team at (800) 274-0099 x 1 for more details. Is there a minimum quantity for a discount ticket purchase? Yes, you must purchase a minimum of 20 discount tickets from our Online Gift Store or at participating theatre locations. Note, our theatres only carry Discount Diamond Tickets is books of 20 tickets. Is there an expiration for discount tickets? No. Our discount tickets carry no expiration dates. Can discount tickets be redeemed online? No. Discount tickets can only be redeemed at a Marcus Theatres location. Are discount tickets valid for evening and weekend showtimes? Yes. Discount tickets are valid for any day of the week and any showtime. Is there a surcharge on discounted tickets? Surcharges may apply. Visit the Online Gift Store for surcharges associated with discounted tickets. Do you have a discounted ticket that includes concessions? Yes. Our Silver Discount Ticket comes with a free popcorn voucher with every two silver tickets purchased. Can Marcus Gift Cards be redeemed to purchase gift cards or other Discount Ticket products? No, gift cards cannot be used to purchase other gift cards or discount ticket products. 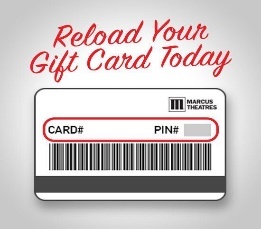 Marcus Theatres Gift Cards are redeemable toward box office, concessions, and food and beverage purchases made at participating Marcus Theatre locations, online at MarcusTheatres.com, and through the Marcus Theatres mobile app. Marcus Theatres e-Gift Cards may not be used to purchase gift cards or other discount tickets. For online purchases, the Gift Card must cover the total purchase price and may not be used with other forms of payment. Protect your gift card and treat as you would cash, as Marcus Theatres is not responsible for lost or stolen gift cards. Not redeemable for cash except as required by law. Please visit MarcusGiftCards.com for a list of Marcus Hotels & Resorts™ locations that also accept Marcus Gift Cards. A gift card has no expiration date or fees associated with its use. Who can I contact if I have additional questions about Marcus Theatres Gift Cards and/or Marcus Theatres Discount Movie Tickets? Please call toll free (800) 274-0099 x 1 or visit ANY Marcus Theatres location near you. Have questions about group sales, advertising, or dontations? Customer Care service is available 9AM - 5PM on normal business days. Call (844) 363-2840. Looking for lost & found items or Theatre location specific information? Contact your local theatre. Share your feedback and let us know how we're doing.